Maxar Technologies (NYSE:MAXR) (TSX:MAXR) revealed that the spacecraft bus the company is building for NASA’s Restore-L project to refuel a satellite in LEO has completed the Critical Design Review (CDR). Photo of the Restore-L’s central structure in Maxar’s Silicon Valley manufacturing facility. Image is courtesy of the company. With the CDR complete, the spacecraft bus is on track to ship to NASA in 2020 for integration with the robotic payload and a forecasted launch in 2022. Maxar is also building both nimble robotic arms for the Restore-L spacecraft, which will capture, manipulate and refuel the Landsat 7 satellite. As previously announced, Maxar is working with NASA Goddard Space Flight Center’s Satellite Servicing Projects Division (SSPD) to build a spacecraft that will rendezvous with, refuel, and safely release the U.S. Geological Survey’s Landsat 7 remote sensing satellite in LEO. Restore-L is funded by NASA’s Space Technology Mission Directorate. In addition to demonstrating the ability to refuel a satellite that was not designed to be serviced, Restore-L aims to validate the use of tools, technologies and techniques developed to enable future exploration missions and jumpstart a new satellite servicing industry for government and commercial customers. The CDR took place over a five-day period at Maxar’s Silicon Valley manufacturing facility and demonstrated that the company’s spacecraft bus design meets mission requirements. NASA missions undergo multiple rigorous technical and programmatic reviews as they proceed through the phases of development prior to launch. The CDR is the third of six major NASA mission milestones, culminating with the spacecraft’s launch. The Maxar-built Restore-L spacecraft bus will provide the structural support, propulsion, attitude control, data and communications interface and power to support the Restore-L robotic payload for the on-orbit demonstration. 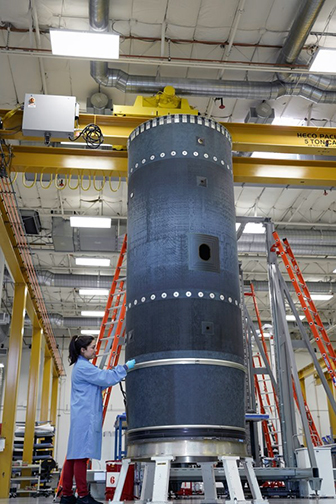 The spacecraft design is based on Maxar’s decades-proven 1300-class platform, which has the flexibility and power to enable a broad range of missions and technology advances. Mike Edwards, Maxar’s SVP of Strategic Growth, stated that the technologies proven on Restore-L are of great value to future exploration and science missions and will play a crucial role in enabling the company's exploration of the Moon and beyond. Satellite servicing is one of many disruptive technologies that Maxar is pioneering to provide customers with expanded options for more resilient and cost-effective operations in space.